It’s a hard reality to accept that sometimes when a game is released, it is, for all intents and purposes, bad. A number of different factors can lead to this outcome; maybe the developer didn’t have enough money or maybe they were forced to rush the game in order to meet a certain release date. When a developer releases a game that didn’t live up to its original vision, more often than not they simply cut their losses and move on. But sometimes, there comes a moment where a developer refuses to give up on a game. Despite the bad reviews, despite the additional costs, despite the added risk of having to push through bad press, some developers decide that their game’s potential is too important to just give up on. One such developer is Spiral Game Studios. Below is my written chronicle of Spiral Game Studios’ humble beginnings, hardships, and eventual success that is supplemented by an in-depth interview I held with the studio’s founder David Prassel. Chances are that, unless you’re an avid PC gamer, you’ve never even heard of Spiral Game Studios. Founded in 1997 by a passionate PC game modder and developer named David Prassel, Spiral’s first major project was something that Prassel dubbed The ORION Trilogy. To Prassel, The ORION Trilogy was so much more than a mere game concept, it was a full-blown intellectual property that he had big plans for. The team’s first playable game, titled ORION: Prototype, was released as a free source engine modification in December, 2009 and featured intense futuristic sci-fi FPS combat. Two teams would duke it out in class-based PvP matches using a robust arsenal of different sci-fi weapons in a variety of maps. The mod was voted “Mod of the Month” by Fileplanet in January, 2010 and a free update released in June, 2010 made it an even more expansive and engrossing experience for PC shooter fans. For Prassel and the Spiral team however, Prototype was just the beginning. Shortly after releasing the June update for Prototype, Spiral Game Studios officially established itself as a full-fledged indie game developer and released the first details of its next project: ORION: Prelude. Unlike the more straightforward PvP fragging formula of Prototype, Prelude aimed to add in some fun new variables such as drivable vehicles and aircraft, jetpacks that added verticality to on-foot gun fights, and, most exciting of all, large roaming A.I. dinosaurs that would populate each map and make a meal out of any unfortunate players that didn’t pay attention to their surroundings. In order to financially support this ambitious next step in the Orion series, Spiral Game Studios turned to what was at the time an equally ambitious form of funding: crowdfunding via Kickstarter. The Kickstarter campaign for ORION: Prelude officially kicked off on January 17th, 2011 and within the span of a month managed to garner $17,686 of its initial $10,000 goal, becoming the first AAA title to successfully utilize Kickstarter. The amount of money Spiral Game Studios managed to raise made it quite clear that players were definitely on board with the idea of jet-packing around and shooting each other while avoiding colossal t-rexes. As 2011 gave way to 2012, the original concept behind ORION: Prelude shifted. Through a series of behind-the-scenes circumstances (explained below), Prassel and his team decided to retool the original ORION: Prototype concept into something that had never been done before. Players had already gotten their fill of PvP combat thanks to Prototype and the free ORION: Open Source game beta which Spiral had released back in April, 2011 so what else could they offer players? Using assets from Prelude’s development, Prassel and his team decided to venture into the realm of cooperative FPS gameplay. Before long, ORION: Prelude became ORION: Dino Beatdown. Unlike Spiral’s past competitive PvP games, Dino Beatdown would be a purely cooperative experience in which a team of players had to survive against waves of encroaching dinosaurs. It would still contain all the features that Spiral had promised for Prelude; jetpacks, vehicles, different character classes, large open maps, and a variety of different weapons, but now the players would have to work together and turn those weapons against waves of large lumbering behemoths instead of against each other. So what exactly caused Prassel and his team to abruptly switch focus? Sadly, the story behind Spiral’s sudden shift in vision is a sordid one and it actually begins before ORION: Prelude had even gotten off the ground. When Prassel came back to the States however, the first signs of trouble soon appeared: “I flew home and we started working on the contract with our lawyer. This is where it started getting shady. The people on Michael’s and the investor’s end were trying to work in some absolutely insane stipulations like jacking up his return amount by 3x the original amount of what was originally discussed. I quickly got it back to what it was originally but this should have been a red flag.” It wasn’t until the investment was actually deposited into Spiral’s accounts that Prassel finally realized what was happening. According to Prassel, his brother had taken one fifth of the total investment amount for himself without ever alerting David or the investor which equated to a loss of roughly half a year’s worth of development funding. Without the necessary financial support to fully realize Prelude’s initial goals, Prassel and his team were forced to work with what they had and pull together an ambitious concept that would later become ORION: Dino Beatdown. It was extremely risky but having all of the pre-made assets from earlier ORION projects definitely helped. Even though Prassel and the Spiral team did their best to recover and finish up Dino Beatdown, when it launched via Steam on May 4th, 2012, it was a disaster. While the game started up and ran well enough, virtually everything else about it was a broken mess. Many of the features originally promised such as multiple maps and achievements were nowhere to be seen, both player and dinosaur animations were stiff and clunky, the dinosaurs and guns didn’t have any sound effects, and the game’s one solitary mode ended up being a simplistic, boring horde mode that was little more than a shooting gallery against poorly-scripted raptors and t-rexes. Despite a series of post-launch title updates that Spiral released for the game, Dino Beatdown was beyond saving. Many within the gaming industry assumed that ORION: Dino Beatdown was merely another case of overhyped trash delivered by a lazy, uncaring developer. Back at Spiral however, Prassel and his team were hard at work trying to pick up the pieces. I myself admittedly bought into the public opinion that this was the end of the line for Spiral Game Studios after having played the original launch version of Dino Beatdown myself. It wasn’t until a few months later that I’d be pleasantly surprised to find out that wasn’t the case. The underhanded betrayal by his brother and the subsequent storm of negative feedback for Dino Beatdown were both hard blows for Prassel to endure but endure he did. In our interview, Prassel admitted that the one big mistake he himself had made was that he didn’t speak up. When he realized what his brother had done, he didn’t reach out for support, he didn’t try to talk to his investors and work things out, he just laser-focused on what he knew deep down was a doomed project. 2012 gave way to 2013 and with a new year came a big new announcement from Spiral Game Studios. ORION: Dino Beatdown was being reborn as ORION: Dino Horde. 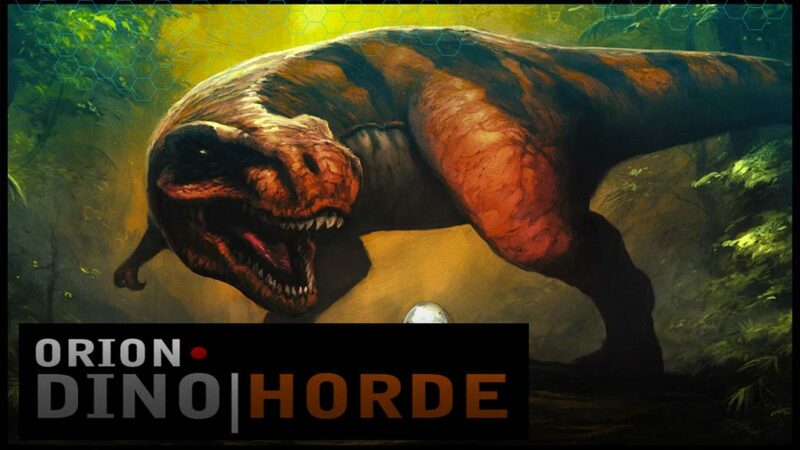 Instead of going back to the original competitive ORION: Prelude concept, Prassel decided to both fold that concept into Dino Beatdown and expand upon Dino Beatdown’s original co-op premise, working the two separate ideas into one brand new game: Dino Horde. ORION: Dino Horde didn’t take the world by storm when it launched on April 15th, 2013, but it did make good on both the promises Spiral and Prassel had initially made with Prelude and Dino Beatdown as well as all the *new* promises they had made with Dino Horde. Despite all the setbacks, despite all the bad press, Prassel and his team had finally released a game they could be proud of and it ended up selling quite well. Since its initial launch, ORION: Dino Horde has been updated with several substantial (and free) digital expansions that have added in a range of new features such as a progression system, character augmentations, new dinosaurs, new maps, and several new modes (including competitive PvP modes and even modes where you can play as the dinosaurs). The latest update, titled the “Arctic Update” also added in a persistent open-world map which includes dynamic weather and a day/night cycle. But as wonderful as Dino Horde’s success has been for Prassel and his team, they’ve already set their sights on what they want to do next: coming full circle. Sometime during the fourth financial quarter of 2014 (between October and December), ORION: Dino Horde is going to evolve once again and take on the original title of ORION: Prelude. Everything that is currently in Dino Horde will remain but with the evolution into Prelude will come a whole range of new additions including new modes, weapons, achievements, character models, and even an entirely redesigned game menu. Instincts and Prelude are just two of the total four games Spiral has in the works and all four of these games tie together into what Prassel has rebranded as “The ORION Project.” Prassel confirmed in our interview that the team at Spiral has the next several years planned out in terms of where they want to take the ORION series and the success that they have garnered from ORION: Dino Horde is letting them do just that. For more on David Prassel and Spiral Game Studios, check out the developer’s official website and be sure to watch the recently-released documentary “Into The Spiral” which further showcases the insane amount of passion and dedication that Prassel and his team have devoted to the ORION series. Hopefully the brother is not involved in this project anymore? Props to a crazy-passionate developer and creator, the likes of which we need more of in this world. Just want to say I bought 4 copies of the game on Steam just now, haven’t heard of it before the weekend sale thing but thoroughly enjoyed it today. I also want to say the glitchiness and bugs brought me to tears laughing; I honestly enjoy that stuff immensely; the Dinosaurs were so surreal and the effects of the ragdoll phsyics made me just lose it when I was playing with my buddy. What impressed me though was after a couple of hours I realized this was actually a really good game. To be honest, I expected the one dollar sale price to reflect the quality of the game as being very poor, which is based on my experiece from Steam. Initially, I was unsurprised to find myself criticizing certain elements and agreeing with the ‘valuation’ of $1. As consumers of content, we just can’t help but compare every game to the polish of the ‘best’ or ‘top’ produced products, so it’s hard for developers to compete sometimes. It’s unconscious and not anyone’s fault. But after a couple of hours, I actually found myself deeply engaged, and my criticisms to my friend (we were skyping) turned into excitement and strategizing as I realized a lot of work went into the production of this and a keen eye for fun had been put into practice in its creation. I wanted to try more game modes and maps, and get more of my friends into the game. So I would have paid more for the game even though I’m not a big shooter fan. It could use a lot of polish still, but the key lies in how after playing for 2 hours I wanted more, and not less. Quality is about fun for me, so as far as that goes it’s top notch. Game is a freakin’ blast. The developer’s story is also inspiring to me, as I’m an aspiring game developer myself. Keep it up! I have a lot of respect for this developer and I’ve watched their product turn from a mindless piece of trash into something kind of mindlessly enjoyable. I haven’t played their newest update because my computer is messed up but I’m going to when I get back on my feet and look forward to seeing the new steps they’re making.